MIDNIGHT IN SAVANNAH. It's a city of beauty, history. And one of the most haunted places in Savannah is a tavern called The Dragonslayer, built in the 1750s. The current owner, Gus Anderson, is a descendant of the original innkeeper and his pirate brother, Blue. Gus summons his granddaughter, Abigail, home from Virginia, where she's studying at the FBI Academy. When she arrives, she's devastated to find him dead. Murdered. But Abby soon learns that Gus isn't the only one to meet a brutal and untimely end; there've been at least two other victims. Then Captain Blue Anderson starts making ghostly appearances, and the FBI's paranormal investigation unit, the Krewe of Hunters, sends in Agent Malachi Gordon. Abby and Malachi have a similar ability to connect with the dead; and a similar stubbornness. Sparks immediately begin to fly; sparks of attraction and discord. But as the death toll rises, they have to trust each other or they, too, might find themselves among the dead haunting old Savannah! The tale is set in historical Savannah, Georgia at a tavern built in the 1750s known as the Dragonslayer. Gus the owner is a direct descendant of the original innkeeper and is pirate brother Blue Anderson. Abigail his granddaughter who has recently graduated from the FBI academy receives a message from her grandfather Gus asking her to come home. When she arrives she discovers her grandfather is dead, and he isn’t the only one. 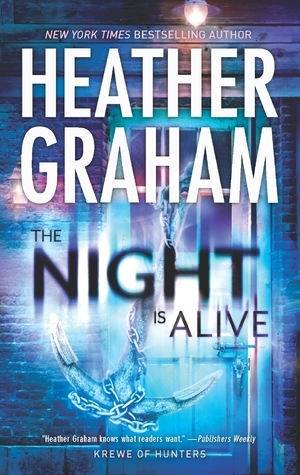 When the police dismiss her grandfather’s untimely death as nothing more than a heart attack, and the ghost of Blue appears she emails Jackson Crowe the leader of an elite FBI unit. When Malachi Gordon arrives from the Krewe of Hunters the tale begins to heat up and the story that unfolds was fascinating, suspenseful with just a touch of heat. Abigail is fresh from the academy and reeling from the loss of her grandfather. She is a strong character, and pieces things together but some of her actions annoyed me. Maybe it was because she was a newbie, or the fact that the suspects were all childhood friends but I never totally connected with her. Malachi Gordon, a former New Orleans police officer turned PI, has a unique ability to talk to ghosts and is assigned this case as a test run after being vetted for a position on the team. I liked Malachi, but didn’t like the way he went off on his own without his partner. The two had an interesting chemistry, he is laid back and she is more “I need facts” with a little snark and this created some tension, banter and heat. It had wonderful moments, but it all kind of fell a little flat for me. I bought into the relationship but just wasn’t wowed by it or searching for me HEA. The suspects and townsfolk were a lively bunch and I loved sorting out who was who. Yo, Ho, Ho and a Bottle of Suspense, the world building is this tale was fascinating, had historical accuracy and I found it to be dark and entertaining. Wrapped in some paranormal woo-woo I was completely caught up in the case. Graham brought this historical area of Savannah alive and shared details of the original settlement, the tunnels, pirates, small pox and other interesting tidbits. The ghosts gave us a glimpse into the past and Blue aided in solving the murders. While I figured out who the murderer was, I found it all to be quite clever as Graham weaved all of the threads and clues together. The ghosts in the cemetery touched my heart and softened me towards the main characters. The tale offered up some darkness, humor, lively suspects and some clothes tossing! The tale has me itching to visit Savannah, but I will be looking over my shoulder for pirates and ghosts! Fans of romantic suspense, historical sites, and murder mysteries will find The Night Is Alive to be a captivating and entertaining escape. The Night is Forever, the eleventh book is due out in September 2013.